The knife was sharp, worked from a black flint stone with veins of gray that seemed to feed the ragged edge with ashen blood. Effortlessly, the knife cut through the victim’s flesh. The animal whimpered feebly as the violation was made. It was a wolf and it was not dead. The man needed it alive. The wolf’s back was broken at the neck, but not fatally so. Until the entire skin had been removed, the wolf must remain alive. He was a master, the man, an expert at the job and he did not make mistakes like killing. He never killed unless such was his need, even if that need was pleasure. The man had trapped the wolf easily enough. It was early winter. The snow in the mountains slowed the smaller animals, but the deer and the elk and the moose were not yet troubled by the depths of snow or by the cover of the vegetation that came later in the season. The wolves were hungry but not desperately so. They would not yet maim themselves to escape a trap. A bit of raw meat set in a snare had caught the wolf, but there was always a chance of damage, so the man had been watchful. He would not let such a precious thing escape. It was a lone wolf, a male, two years old. It was strong but not yet strong enough to have a territory of its own, to have females. And so the lone wolf had been easily caught, and there was no help for it now. Kneeling beside the fire and chanting ancient words, the man made his first cut long and deep. It started under the wolf’s chin, in the soft spot between bones, and the cut traveled on and on and on, down over the wolf’s sternum and then his stomach. The cut circled his male organs and his lower vent, then split down each leg. Carefully, expertly, the man removed the legs from inside the skin, slipping them like a hand from a well made glove. Nothing of the skin could be wasted. It had to be perfect. In the same way the front legs were done, and then finally the head. In one unspoiled piece, the entire skin was removed. 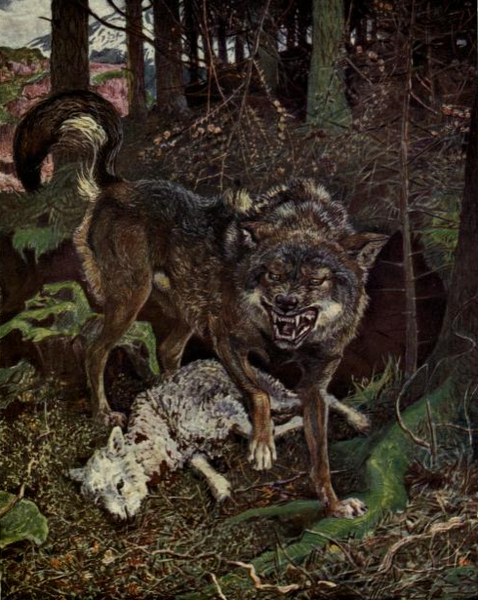 The wolf whimpered again for mercy, begging for death as it saw its hide spread upon the ground. The man did not answer the plea. He took a burning stick from the fire and quenched it in the snow. With the black remains he drew sigils on the inside of the still live flesh, signs of power that predated words, signs that had been gifted to mankind long, long ago. And when the work was done, the man took off his clothes and stood naked in the snow. Reaching up to the sky and then bending low upon the ground, he made the invocation, putting the evil to work. “What’s this?” Lynn Weigenmeister said as she stepped out her front door. There, on the porch in the snow, was a newspaper. Confused, wary, she looked over the freshly fallen snow, searching for some sign. There were no footprints, no tire tracks, only virgin snow upon the ground. Picking up the paper with caution, she looked it over with a great intensity, wondering what the thing was and how it had gotten there. She didn’t have a subscription to the newspaper, had never had one, and newspapers just didn’t fall accidentally at one’s doorstep in her neck of the woods. She lived out in the country, far from town, far from any other home, too far from civilization for paper delivery. It could only have arrived by magic, or at least by some purposeful means. She looked round once again, trying to find some spy or agent that could have placed such a thing in her way; but she found no one, not even after using her certain unique abilities to make the search. After shoveling the walk and the drive, Miss Weigenmeister brewed a cup of tea and sat down at her kitchen table, the curious newspaper before her. She sung a few verses of an old song that she thought might help with the process, but was revealed nothing. Then she tried an amulet gray with age. That didn’t help either. At last, she poked the newspaper. Nothing happened. “Well, I guess there’s nothing else for it, then,” she said in a nervous sort of way, removing the plastic bag in which it was delivered, smiling in a private way about how little boys used to take such pride in how they folded a newspaper for delivery, and how they had once been able to make any number of boats or hats or airplanes from the remnants of the day’s events. She even remembered a particular part of a book about a curious monkey making a fleet of boats from a stack of newspapers before riding a rocket into space. But then, she thought with an ache in her heart, now children had television and computers, and plastic bags. Opening the paper, she ignored the national and state news, thinking that whatever was happening in the world at large was not something she could be expected to deal with. When she came to the regional section she found out what the big story was. The local high school athletic team had won some important competition and was moving on to the national level. “Well, that can’t be it,” she said aloud, reading on. There were stories about the impact of new state legislation, a proposal to replace the old swing bridge across the Ontonagon River, all things that she didn’t have much interest in, having gone through it, in one way or another, before. Then, on the top of page three, there was an article about the loss of a cow on the old Gagnon Farm north of town. The cow had been killed and eaten by wolves. It had happened two days ago. The Department of Natural Resources had been called in, and confirmed the cause of death. Such a thing happened from time to time, but usually much later in the season, and the tragedy usually involved an unlucky calf, the mother being too big to succumb to an attack by a starving pack. The DNR were moving to capture and remove the offending animals for resettlement in a more remote location, but these attempts so far had yielded no positive result. “Five,” Joe said, handing over a fifty dollar bill. “Thanks, well, I got to get going.” He picked up the bags in explanation and headed toward to door. Miss Weigenmeister had been listening intently to the conversation, waiting in line to be seated while Joe Gagnon paid his bill. The apple pie was sold out, sent to feed the men working in the snow. Blueberry and pecan was left. Miss Weigenmeister ordered the blueberry but she had already gotten what she came in for. The trouble at Gagnon’s Farm was not over. The wolves had returned. After eating the pie at her desk with afternoon tea, Miss Weigenmeister closed the library. She wanted to get out to the Gagnon Farm while it was still light out so she could look over the scene, perhaps come up with some sort of plan before the moon rose. Locking the exits and shutting off the lights, she went to the lady’s restroom. There she bolted the door behind her, opening the window on the far wall. She took off her clothes, folding them neatly and leaving them on the basin. Then she looked into the mirror and was struck by how severe, how very much like a crow’s her own eyes had become. That was how the change began. She thought about the sun and sky, riding the winds high above the trees. She thought of the crow’s speed and its tricks and how it used its talents in avoiding enemies. Her eyes grew fully black. Her nose lengthened and hardened, becoming beaklike. The fine hairs on her arms broadened and lengthened into shiny black feathers and her arms folded into wings. In a rush the transformation was complete, and she flew off through the open window and into the sky. The bare trees along the road provided a haven as she made her way out of town, beating her wings in short flights, taking the guise of a perfectly normal crow in search of an evening meal. The houses and trees of town gave way to fields, the stubble of corn yet visible through the blanket of snow. The wind was cold and the dark clouds hinted that more snow was yet to come, likely that same night. The old schoolhouse came into sight, the red stone of the old two story building rising above the field as a beacon upon the shores of Lake Superior. On one side of the building a scrawl of painted letters read, “Eat more beef”, and Miss Weigenmeister knew she had arrived at the Gagnon farm. She landed upon the roof of the abandoned school, careful to avoid the holes that time and neglect had made. Other crows were there in the old building; and there were gulls too, all making noise in the abandoned classrooms, sounding like the ghosts of children. Trees had grown up near the old structure, but had not otherwise been allowed to take root and gain size, so there was a good view of the lands in all directions. She saw where the men were, out at the edge of the fields, away in the swamp where wolves were thought to go until night fell. Miss Weigenmeister flew down to them, listened for a while but heard nothing of importance. From up in the sky she spied the place where the fateful meal had been taken. The only remains of what had happened in this place, the blood soaked ground and snow. She saw that the men had followed tracks into the woods, but their search had stopped a mile into the wilderness. She flew on, following the wolf tracks, thinking to find a cave or some other hiding place. That is what she found some five miles distance from the farm. It seemed to her a long way for such a beast to come for a meal, especially two nights in a row. The wolf’s den was a shallow hole dug under a popple tree. Finally she lit upon a branch and waited, deciding what to do next. “Well, you could try being a little more agreeable for one,” Miss Weigenmeister said with a librarian’s equivalent of scorn. She tried to see down the hole, feeling that if she were being watched, having a look herself would not be impolite. For all the darkness, she could see almost nothing down there, lest it be the black nose at the end of a long snout. “Oh? So I missed my guess, eh? Well, you don’t smell much like a witch, but I wouldn’t mind a little entertainment!” As the last was said, the wolf leaped from the den. He was much bigger than an ordinary wolf, and he moved twice as fast. He was out of the den and jumped toward the limb where Miss Weigenmeister sat in the blink of an eye. But he wasn’t fast enough. The crow took to the air, flapping her wings calmly once or twice before settling on a branch higher up, one that was comfortably out of range for even an extraordinary wolf. She chuckled to herself, thinking how difficult it was to catch a crow off guard. “Get back here! Get back here or I’ll rip you to pieces!” the wolf shouted, making several half hearted attempts to knock her off her perch. “Well, how rude. Now that we understand each other, I’ll be going.” And with that, she took to the sky. That night despite the cold, Miss Weigenmeister tucked a few choice books under her arm and went outside to the patio, setting her things down on one of the benches that encircled a much used fire pit. But before starting her research, she set about making a fire. She knew that having a very hot fire was a necessity, so on the way home from the library, she had stopped at the local hardware store. After digging around in the back for nearly twenty minutes, the clerk finally produced the last bag of charcoal in the place. With the bag from the hardware store and the half bag that remained of her own stock, Miss Weigenmeister made a good sized pyramid, following the instructions on the back of the bag in such a way that would make all the folks at Kingsford proud. Satisfied with her work, she doused the whole thing with excessive quantities of kerosene, and at the touch of a match, the pyramid was in flame. The fire started, she went back into the house and returned with a pair of tongs, a small sort of cup made of clay, and a finely made, walnut case. She opened the case and took a deep, sad breath. One must be sacrificed, she knew. There was no way around it, not now, not with so little time remaining. Though she had brought the books out with her in hopes another way could be found, she knew that such hopes were false, fantasies of an overly optimistic, overly sympathetic, heart. She gazed into the sky, trying to think if there was another way. Such a deed was entirely loathsome, perhaps one of the most terrible things that she had ever set about doing. But it gets dark early in the north during the winter and she could waste no more time. Moon shadows had already gathered. With a silent prayer for forgiveness, she looked again into the case, seeing before her the magnificence of the family silver as the pieces glinted in the firelight. With reverence and not a little indecision, she began to reach for a teaspoon. “Oh, but you are so dear to me,” she said, taking back her hand suddenly as if burned. She knew the teaspoon could be the only real choice, the responsible choice. There were eleven others, after all, and something like a butter knife might seem useless in the grand scheme of things, but it would be impossible to replace. Then she made the choice. Plucking up her courage, she selected a shrimp fork. Saying, “I never did like seafood much anyway,” she quickly shut the lid before she could change her mind. Into the crucible the fork went, and with the pair of tongs, Miss Weigenmeister carefully placed the vessel into the center of the fire and waited. There was a terrible crash. Miss Weigenmeister woke abruptly, throwing back the covers and landing with bare feet upon the cold floor. Hearing the rush upon the stairs, she left off putting on her robe and slippers and reached for the gun, just as the wolf struck her bedroom door. “Daddy’s home,” the man in wolf’s skin shouted merrily. Again he struck the door, and this time, it broke open. A brilliant flash and a deafening crack, the smoke and noise an insult to the senses, the blunderbuss bucked like a cannon as Miss Weigenmeister pulled the trigger. The man was knocked against the wall, then dropped to the floor. The shot had taken him in the chest, and he could do no more than look up in confusion as he breathed his last. The wolf skin began to change. It shriveled as if days had passed, breaking open where the knife had done its work, revealing pink skin underneath. No longer did the body of the man fit so neatly within its confines. It was an animal skin, a covering a man might use as any other, like a shirt or jacket, no longer magical in any way. With caution, Miss Weigenmeister stepped toward the body, not knowing what to expect. The man was dead, and it was certainly the body of a man that lay upon her floor. She wondered what the people from the game department would say, it from what had happened here if another conclusion would be drawn. That was none of her concern. She was just a woman defending her home. She whispered to the blunderbuss, setting it down on the bed. Like the wolf into a man, the gun took another form. But this was only an illusion. She had no power to change what the blunderbuss was. It would seem real enough to anyone who might take an interest, a twelve-gage pump action shotgun, nothing special. Mike Phillips is the author of Reign of the Nightmare Prince, available in fine bookstores, online booksellers, Kindle and Nook. His short stories have appeared in ParABnormal Digest, Cemetery Moon, Sinister Tales, The Big Book of New Short Horror, World of Myth, Dark Horizons, Mystic Signals and many others. Online, his work has appeared in Darker, Lorelei Signal, Midnight Times, and Fringe. He is best known for his Crow Witch and Patrick Donegal series.